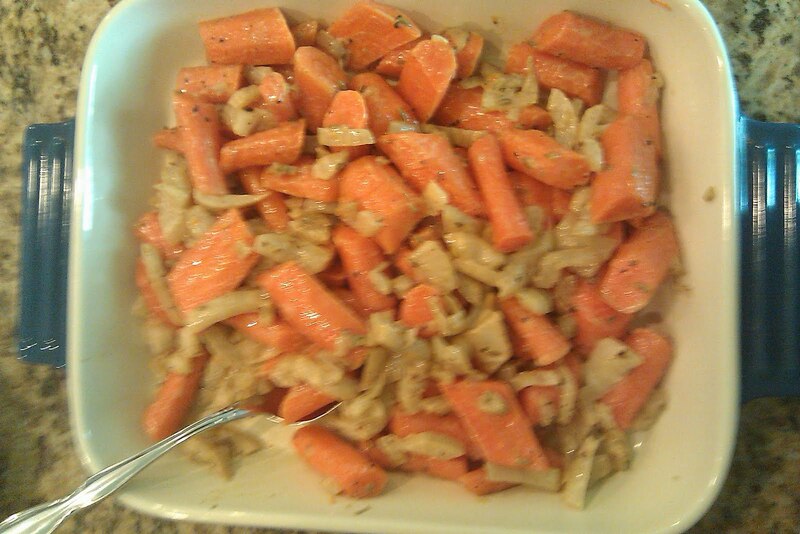 I had a large bag of organic carrots along with 2 bulbs of fennel (mad cheap at TJ's) sitting in the fridge so my plan was to serve roasted carrots and fennel as a side dish at Easter dinner. A quick Google search led me to AllRecipes where someone had suggested using fennel seeds and ground coriander. Seemed like a good idea, so I peeled and chopped the carrots in advance, diced up the fennel and popped it in the fridge to await cooking the next day for our big Sunday meal. Turns out I don't read directions very well as the recipe was not for roasting but for some sort of shredded carrot stew concoction. We were short on time at this point, roasting was no longer an option anyway. Yay for happy accidents because it yielded me a new favorite side dish. I popped the raw veggies in the microwave to soften them up before stove top cooking. The flavor was rich but not overpowering and has been fantastic as a leftover this week. If you're growing tired of roasting carrots or cooking them in butter (Mom's M.O.) then try this dish out. Soften vegetables in the microwave until forkable. 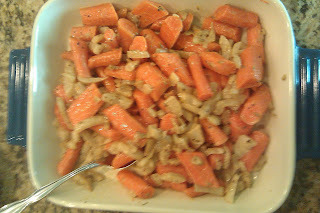 Dump the carrots and fennel in a skillet on medium high heat. Add several dashes of ground coriander and fennel seeds, keep this at a 2:1 ration (more coriander than whole fennel seeds). Season with S&P, taste test and increase the seasonings as needed. After 2-3 minutes of warming up the spices pour in heavy cream and continue to stir until it thickens. This dish is not meant to be liquidy, rather the cream should form a thin layer around the veggies. Serve and Enjoy! ->No need to stick to my measurements, not every day calls for 3lbs. of carrots. Another great option would be to use a bag of baby carrots which would save even more time as they require no peeling or chopping. Haha, I love how the description for your blog says that you were on a 7 week experiment and your first paleo posts are a year old. I'm three months in, and can't imagine going back to eating the Neolithic Agents of Disease. I've actually never cooked fennel. It's kinda sweet, though - right? Like liquorice-flavored celery? I bet that would be awesome playing off the cream..